Baby name trends tend to vary by generation. Baby names waver in popularity, depending on which region of the world they are born in. 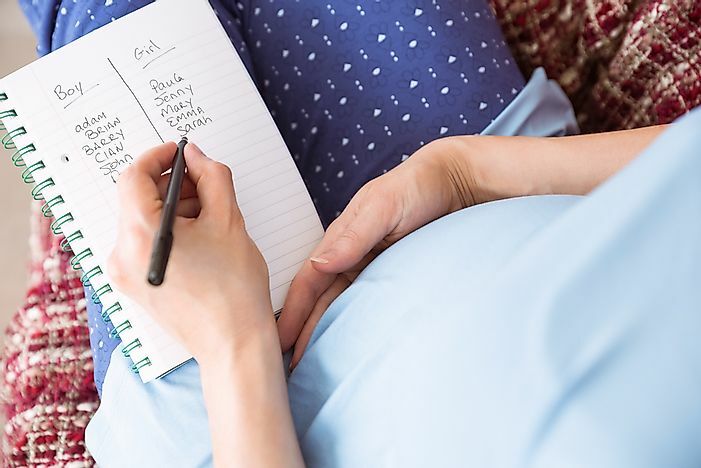 Baby names vary depending on the region, family, generations and even the time the baby was born. However, some names are common in some parts of the world than others. This is an outline of the popular baby names from different parts of the world. Emma is a popular name for baby girls in the US while Liam is the most popular boy name. Emma is a short form for Germanic names that start with "ermen". Liam is an Irish short form of William. In Canada, Olivia is the most popular name for baby girls while Asher is the most popular for boys. It is believed that Olivia originated from Latin word “oliva” which means olive, but it was first used in its current form by William Shakespeare in his play ‘Twelfth Night' (1602). Asher means "happy" or "blessed" in Hebrew. Amelia is a popular girls' name in the UK while Jack is a popular boys' name. It originated from Germany and was the name given to the daughters of George II and George III. Jack is derived from “Jackin” which means an independent man, it became common during the Middle Ages and became a slag that meant “man." In France, Louise is a popular name for girls while Gabriel is popular for boys. Louise was a common name among the royal family including the Belgian royal family, Dutch royal family, and the British royal family. Gabriel originated from a Hebrew name (Gavri'el) which means "God is my strong man." In Christianity, Gabriel was the angel sent to deliver news to Mary and Elizabeth concerning the births of their sons Jesus and John. Mia is a feminine name that is popular in Germany while Ben is popular among boys. It is a common name among the royal families and celebrity babies. Mia is a German and Dutch diminutive for Maria and is linked to an Italian word mia which is translated to mean "mine." Ben is a short form for Benson, Benjamin, Bernard, and Benedict. Julia is a popular feminine name in Brazil while Miguel is popular among boys. Julia is a feminine roman name that was popular among the Roman family and was used by Julia Augusta who was the wife to Emperor Augustus. Miguel is a Spanish and Portuguese name that was popular among the Spanish royal family , one of the users of the name was Spanish novelist Miguel de Cervantes Saavedra (1547-1616). Iminathi and Junior are the most popular name in South Africa for newborn girls and boys respectively. Iminathi originates from Xhosa and means "God is with us." Although it is popular in South Africa, it is rarely used outside the county. Junior originated from babies who had a similar name to their fathers, and they would be referred to as “junior” to avoid confusion with their fathers. Wang Fang and Zhang Wei are the most popular baby names for boys and girls in China respectively. The name Fang originated from the descendants of king Yan Di, one of his descendants named Yu Lei was awarded the land of Fang as a prize for fighting off invaders. The name Zhang also originates from a lineage of kings. The grandson of emperor Huang Di invented arrows and bow and was awarded the name Zhang which means bows. Saanvi and Aarav are the most popular names for baby girls and boys respectively in India. The name Saanvi means "Goddess Lakshmi". Aarav originates from Sanskrit word “rav” which means “melodious music” and is used to describe a person who is wise and well composed. It is currently popular among celebrity children in India. Charlotte is a popular baby girl name in Australia while Oliver is popular among the boys. It was popular among the British in the 17th century and is a French feminine diminutive of the name “Charles." The name “Oliver” was common in medieval Britain until the 17th century when it became unpopular because it was associated with an infamous British commander Oliver Cromwell but later regained its popularity in 1938 due to Charles Dickens' novel "Oliver Twist". Olivia is a popular name for baby girls in New Zealand while Oliver is popular among baby boys. It is believed that Olivia originated from Latin word “oliva” which means olive, but it was first used in its current form by William Shakespeare in his play "Twelfth Night" (1602). The name “Oliver” is the most popular name for boys in New Zealand, and is of Old French origin. In Mexico Maria Guadalupe is the most popular name for baby girls while Jose Luis is popular among boys. Maria Guadalupe is translated to mean "Our Lady of Guadalupe". Guadalupe is a town in Spain associated with the virgin Mary. In Hebrew, the name Jose Louis means “God will add." In Sweden, Elsa is the popular name for baby girls while Lucas is popular among baby boys. It means a “truthful person” who can be trusted. Lucas is a Latin name associated with “Luke” a doctor who traveled with Paul, the Apostle. Luke authored the third gospel and the books of Acts. Seo-Yun and Min-jun are the popular baby girls' and boys' name in South Korea. Seo-Yun means a person who is audacious, auspicious, and felicitous, while Min-jun refers to an individual who is witty, sharp, gentle and talented. Emily and Jack are the common baby name in Ireland. Emily was introduced to the British by the German House of Hanover when princess Amelia Sophia was referred to as Emily by the British. Jack is derived from “Jackin” which means an independent man, it first became common during the Middle Ages.